OMG! There’s a dumpster at the Aurora. A dumpster raises the specter of “progress” at the Aurora. November 6, 2018. © Blogfinger undercover staff photo. By Paul Goldfinger, Editor and Jack Bredin, researcher/reporter. 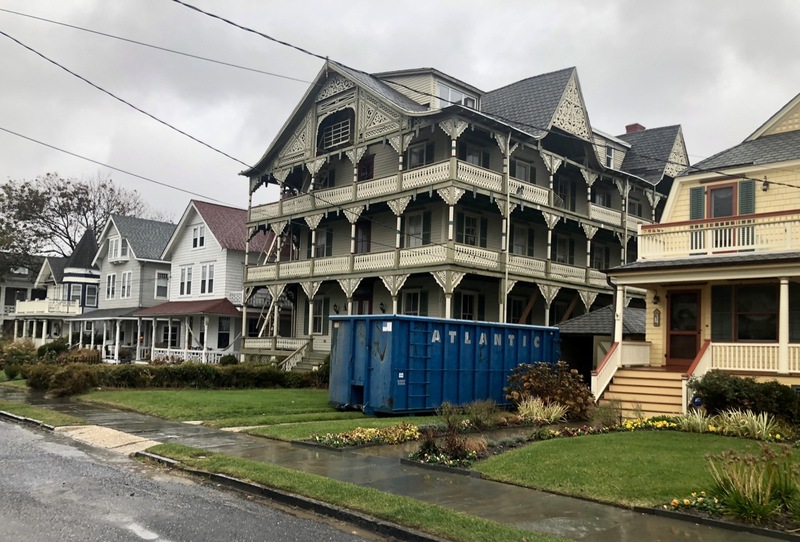 As you may know the Neptune Township Board of Absurdities granted a use variance to the new owner of the Aurora Hotel. He was given permission to turn that building into two structures separated by a wall. He wants to have two single family units on each side, equaling 4. The Aurora project cannot proceed legally until: the developer receives approvals for a legal subdivision, a site plan is approved, bulk variances are received, and the HPC issues a Certificate of Appropriateness. Then, after all approvals are given, the developer can apply to the Building Department for permits to stick in the window of the building. a. No work can be done inside without an approved site plan. b. A subdivision has to occur, turning this single lot into two, but there is not enough room for such multifamily housing on that single lot which is only about 4,700 square feet. More like 120,000 sq ft. would be needed. The single lot was once a double lot in 1879, but that is no longer true, no matter what Mr. Haney says about reverting to historic zoning maps. c. The bulk variances have to do with eliminating the requirement that a rear yard separate the two lots, since both buildings will be attached. d. There is a lawsuit pending regarding the Board of Adjustment’s awarding a use variance. So, what is the dumpster doing there? Well, there are no restrictions regarding bringing junk out of the house and into the dumpster. But if there is work being planned inside and/or outside, that would have to wait for the various approvals. Hopefully the Township won’t allow that dumpster to remain without progress being made to fill it up. Surf Avenue is never without dumpsters ! it seems. I was shocked to see this latest due to the fact that I know that all the approvals are still missing. Yet another visual that our history is being overtaken by those who have no interest in preserving the past. Where are we racing to ? 120,000 square feet? Almost three acres? November 8. A citizen reporter tells us that the dumpster is now filled with insulation. Another Grover heard that the owner was going to remove the garage and structure behind it. That was discussed at the Board of A. variance presentation—regarding some parking on the property. The Aurora is a key structure in the Historic Flare. Absent site plan and subdivision approval, demolition of the key structure, garage, shed, chimney, and or any other structure or portion of the structure cannot be approved by the Board of Adjustment without first having approval of the HPC, prior to construction, or any ‘work’, whether it requires a construction permit or not. According to the Neptune Township Zoning Schedule, the minimum lot area for multi-family housing is 120,000 sq. ft. I find it perplexing why the Township Planner and Engineer at the meeting did not share this information with the members of the Board. The dumpster just left the Aurora. And it was full of wood….what’s going on inside ?